Is SunEdison Trying to Conquer the Wind Industry With This $2 Billion Acquisition? A $2 billion deal with Invenergy is only the latest in a number of transactions that distinguish SunEdison as a dominating force in the wind industry. Cohocton Wind Farm/ Dutch Hill Wind Farm New York. Source: First Wind. What's in a name? Isn't "wind" just as sweet-sounding as "sun"? According to SunEdison (NYSE: SUNE), the answer is a resounding yes. In addition to solar, SunEdison has been busy over the past few months expanding its wind portfolio -- perhaps most dramatically by acquiring Invenergy for $2 billion. Don't be fooled, though, for this is only the most recent transaction. The company, in several other major deals, is demonstrating a significant commitment to diversifying its renewable energy holdings in order to strengthen its yieldco, TerraForm Power (NASDAQ: TERP). In helping to grow TerraForm Power's portfolio by 930 MW, SunEdison recognizes the deal with Invenergy as an excellent opportunity to better sustain (and grow) TerraForm Power's dividend. According to Carlos Demenech, TerraForm Power's CEO, "This transaction is expected to be immediately accretive to our shareholders, extend the visibility of our growth trajectory and unlock significant value as we aggregate a highly fragmented industry." Beech Ridge, West Virginia. Source: Invenergy. After the announcement of the deal, TerraForm Power increased its 2016 dividend target from $1.53 per share to $1.70 per share. Previously, TerraForm Power had declared a dividend of $0.325 per share for the first quarter of 2015 -- $1.30 per share annualized. Acquisition of Invenergy's seven contracted wind farms located in the United States and Canada is expected to provide TerraForm Power with $141 million in average unlevered cash available for distribution, or CAFD, annually over the next 10 years. Partnering with, Gamesa, a Spanish wind turbine manufacturer in a 50/50 joint venture, SunEdison earlier in the month signed a Memorandum of Understanding to develop up to 1 GW of wind farms globally by 2018. Once construction of the facilities is completed, SunEdison will acquire them with the intention of dropping them down to TerraForm Power. Exact terms and the signing of the agreement are expected to be finalized by the end of the year. The deal is an important one for SunEdison because it will give the company several opportunities in India and Mexico. Accounting for about 66.5% of total renewable energy capacity, the wind power market in India is expected to grow further in the coming year, and the government has committed to adding another 60 GW of wind power capacity by 2022. The opportunity in Mexico is also considerable. Setting a target for new capacity of 9.5 GW by 2018, the Mexican government is also looking farther down the road, targeting 15 GW of capacity by 2022. Where else is the wind blowing? The deals with Invenergy and Gamesa are impressive, but SunEdison was just as active in the beginning of the year when it purchased 500 MW of operating wind plants from First Wind and another 8 GW worth of projects in development. In addition to the wind assets, SunEdison purchased 20 MW of solar. The company expects the entire portfolio to add $73 million of CAFD for 2015. Earlier in the month, the company extended its bragging rights on the state level when it closed financing on the 185 MW Bingham Wind Project in Maine. TerraForm Power plans on acquiring the facility when it becomes operational sometime in 2016. SunEdison will perform operation and maintenance services for the project. Yet another major transaction distinguishing the company as a leader in the industry was its acquisition of Atlantic Power's 521 MW wind portfolio -- a deal the company expects to provide $44 million of CAFD annually over the next 10 years. Will debt blow them away? As with any investment, one must consider the risk as well as the reward. SunEdison is taking on significant amounts of debt in order to acquire the projects which it intends to drop down to TerraForm Power. Arguably, evaluating the company's debt to equity ratio is not the best way to determine if it is too highly leveraged since the yieldco model relies on assuming high debt; nonetheless, it is worth taking a look. Even more telling, though, is how it compares to its peers -- parent companies of other yieldcos, like NextEra Energy and NRG Energy. Clearly, SunEdison has been very aggressive over the past year in taking on debt. One way to evaluate the TerraForm Power's leverage is by looking at its net debt to EBITDA ratio. 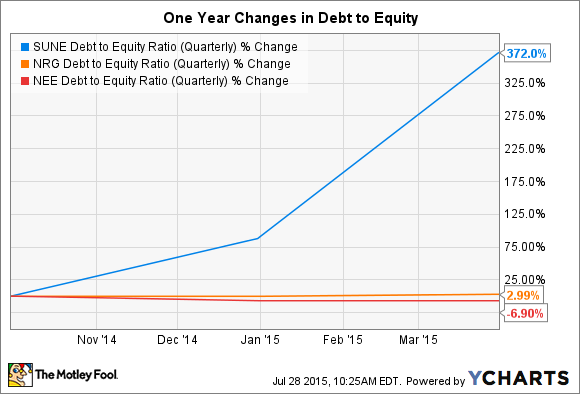 This assesses how able the company is to pay off its debt based on its earnings. Similar to the yieldco model, MLPs also use net debt to EBITDA to ascertain financial health. For these companies a ratio at or below 4.0x usually yields an investment grade credit rating. Compared to its peers, TerraForm Power and its debt is excessive. Standing at a ratio of 18.9x, TerraForm. By comparison NextEra Energy Partners (NYSE: NEP) has a ratio of 7.5x, and NRG Yield (NYSE: NYLD) sports a 12.0x multiple. There's no doubt SunEdison is serious about developing its wind portfolio -- a portfolio that it hopes will blow sustained dividends in the way of investors. The company argues that the acquired wind projects are stable sources of capital, secured under long-term power purchase agreements, but, investors must look at the good along with the bad. The highly leveraged company is young, and it's unclear whether it can maintain the delicate dance between dealing with debt and dividends. It will be especially interesting, in the next earnings report, to see how recent deals like the $2.2 billion acquisition of Vivint Solar have further affected this dance.